Lunch at Nobu KL | Teefa Says.. If you're into Hollywood celebrity gossip, you would've known that Nobu is a restaurant that they frequently dine at. Nobu opened in KL, specifically at Tower 3 KLCC, sometime in late 2014. 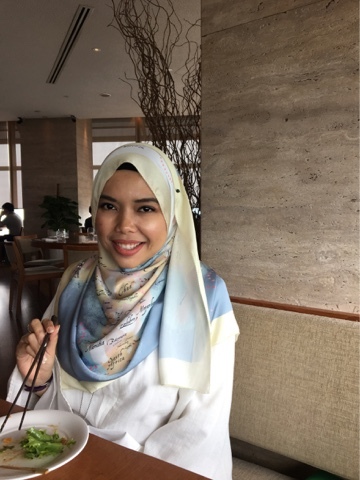 With 33 restaurants all over the world, KL's foodies were excited for the opening and so many blogs reviewed on their food. Naturally, being a celebrity foodie kepochi that i am, i've been wanting to go and try their signature dishes since day one. But of course, as a mere rakyat marhaen i always wondered "Mampu ke nak makan kat Nobu?" i ain't no Marion Caunter, you know. At last, bertemankan Amal (seorang kawan yang juga Hollywood kepochi), i got to dine at Nobu today at lunch. Amal made a reservation yesterday (Nobu is so cool that you have to book ONLINE), and at 12pm sharp, we're in the (dedicated) lift, making our way up to the restaurant which is located on level 56, Tower 3, KLCC. 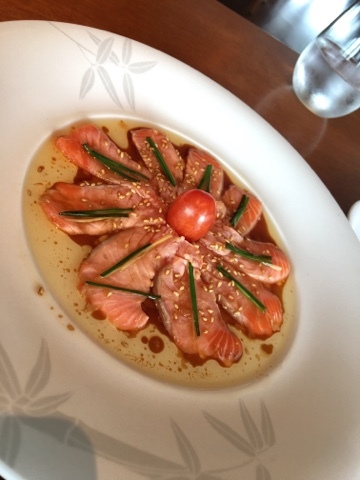 For appetizer, we ordered two of Chef Matsuhisa's signature dishes, which were claimed as the dishes that changed his career as a chef; New-Style Salmon Sashimi and Rock Shrimp Tempura. And they didn't disappoint. 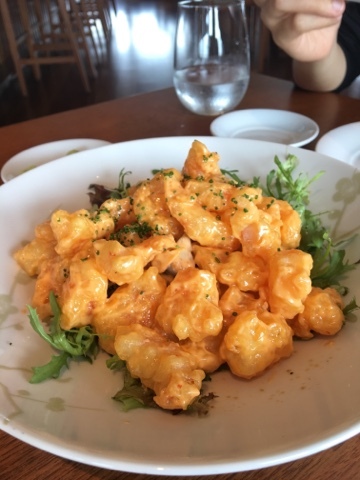 The salmon sashimi is made of fresh salmon sashimi that is poured on with a sizzling hot sauce of what taste like sesame oil mixed with soy sauce, some ginger and garlic.The Rock Shrimp Tempura is basically shrimp tempura coated with a creamy sauce that taste like mayo-chili sauce. For main course, we decided to order Bento 56, to share. 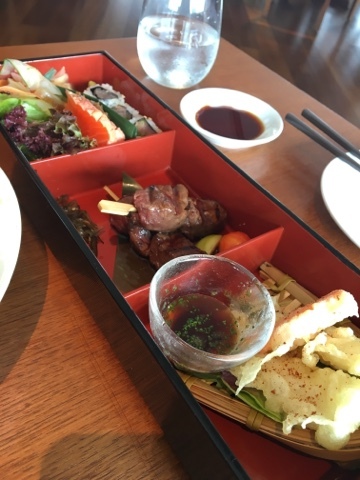 This bento consists of Salmon Sashimi Salad, Spicy Tuna Cut Roll, Assorted Tempura with Ponzu Sauce, and Beef Kushiyaki with Teriyaki Sauce. After our delicious appetizers, we're a bit disappointed with this bento. No doubt, ingredients taste fresher than your average casual Japanese restaurants but taste-wise, there's nothing to shout about. The bento is served with miso soup which came after we've finished all our food and ready for bill and it taste no better than the miso soup i always make at home with miso paste bought at Isetan. Basically a tuna belly cut. Not what we expected because the picture we saw online is different. 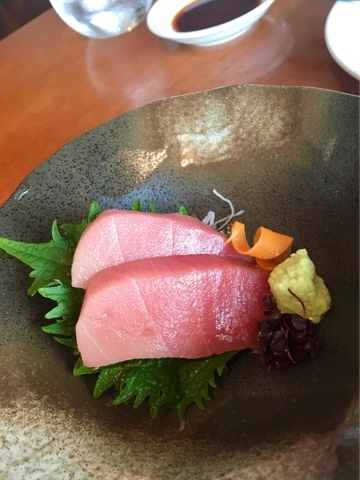 Again, the fish tasted fresher than the ones i always have at Sushi Zanmai but at the end of the day, it's still just freshly cut tuna. Overall, we had a good time at Nobu. If you know what to order, you'll end up with explosion of taste in your mouth, like we had with the sashimi and shrimp tempura. Our two other dishes were rather plain. Still, no regret whatsoever. The prices are a bit steep but it is expected at a fine-dining restaurant. i'd go again, tho not too soon (probably in a year time). i look fat here but i swear i'm not actually that fat.